I’m having a crash course in using InDesign for indexing–for eBook indexes. Lucy Haskin’s webinar through ASI and her presentation at the ASI conference in Seattle were a tremendous help. But…. InDesign is loaded with little tool panels that pull out and float, and a bazillion little iconic buttons that are not necessarily self explanatory if you’re not a consistent user. The Adobe help files were useful–actually more than many other help files; however, I wanted more–just a bit nervous about this first linked index in InDesign. I did a Google search, and found some other very helpful material. At Lynda.com i found online courses in many aspects of InDesign CC, including its ePUB features, so I spent the day “cramming” and practicing indexing in InDesign. (Lynda.com has a 30-day free trial, but the three courses that I’m working through are well worth the price of $25 for a month! I may even keep it longer since there are courses in other software. The InDesign sections on indexing discussed plugins to help with the proocess–including those that Lucy described (KPS plugins). 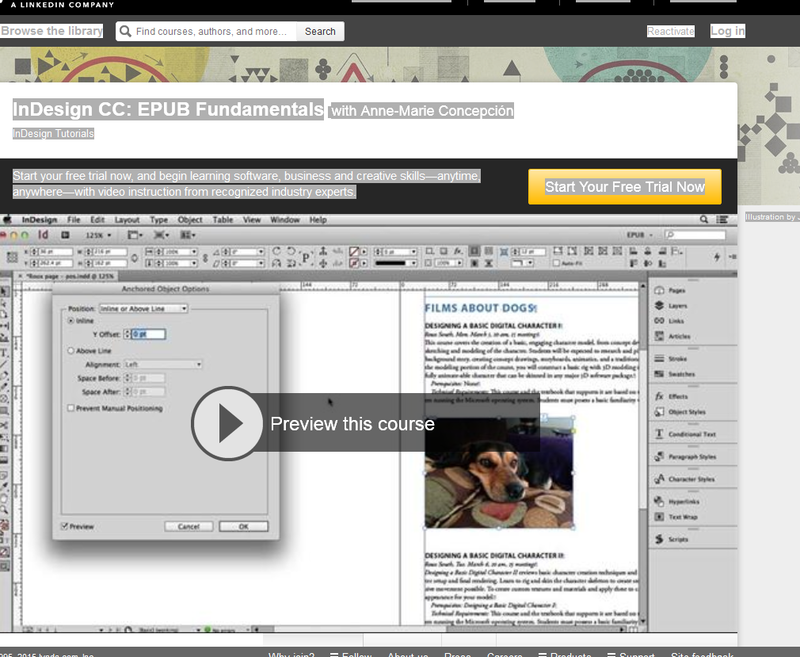 The EPUB, indexing, and hyperlinking parts from the InDesign courses were quite helpful. I am going to do some of the “basic” InDesign courses because I think it will help me in communicating with clients about the hyperlinking and production process.